Cruises from Venice offer the Mediterranean and Adriatic Sea like no other. The city of Venice boasts a charm and history all its own which makes it a superb port for departure, arrival or just a stop on the itinerary. Here are just 10 of the best cruises offered from Venice. The Princess Cruises 12 day Grand Tour departs Venice and stops in Turkey, Greece, Italy and Monaco before heading to the port at Barcelona in this one way trip. Royal Caribbean leaves the Venice cruise terminal and takes you on an 11-night cruise offering all the sights of Greece and Turkey. On the Ancient Treasures cruise offered by Costa Cruises, you see the lovely Greek Islands as you cruise on an intimate ship on a Venice round trip excursion. Cruises from Venice aren’t only aboard the big ships, when you choose the Star Clippers you sail on a ship with sails and cruise the Adriatic Sea on scenic cruising days with stops in Brinolisi, Rovinj and Triluke Bay. Adriatic Sea cruises are part of the sailings with Celebrity. Enjoy 12 nights with stops in Koper, Valletta, Catania and Naples. Royal Caribbean offers a Venice to Greece cruise with sailing on the Adriatic Sea as well as stops in Corfu, and Bari, as well as many more in this 6 night excursion. MSC cruise lines offer a cruise from Venice to Athens. This 7 night cruise highlights the ports of Italy, Greece and Montenegro. The Radiant Riviera is offered by Oceania Cruises from Venice. Visit the colourful St. Tropez, Barcelona and other places while cruising the beautiful Mediterranean Sea. MSC has a 7 night jaunt with stops in Italy, Greece, Turkey and Croatia before returning to the lovely port of Venice. Cruise with Norwegian aboard the 6 day sailing that takes you roundtrip to Venice stopping in Croatia and Greece along the way. There are plenty of things to do in Venice either before or after your cruise. It is a romantic city on the water that is full of history and sights that can’t be missed. 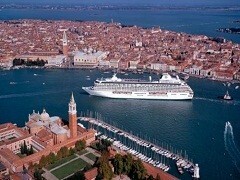 Venice makes for a great departure port for cruises all over the world. Choose to cruise the Mediterranean, the Adriatic or ports further from home when you choose cruises from Venice on your next holiday.